Tomatoes can be grown indoors, but some cultivars are better suited for the job than others. When deciding which plants to choose, taking the size of the plant into consideration is just as important as light and water requirements. Many tomato plants can grow 8 to 15 feet wide and are not suited to growing indoors. The best tomatoes for growing indoors are the smaller varieties such as Pixie or Tiny Tim, but there are some of the larger, slicing tomatoes that grow well in indoor settings. Pixie tomatoes are a small, compact plant that produces many small fruits. Each fruit is about 1 3/4 inches in diameter--about the size of a quarter. The plants are well-suited to indoor growing because of their compact size and density of foliage. Pixie tomatoes come in several varieties which include Orange Pixie, Striped Pixie and Scarlet Pixie. Each has its own characteristics, but all are similarly sweet and meaty. Pixie tomatoes mature in about 52 days. Each patio tomato plant grows to about 18 inches in height and is a very compact plant with dense foliage. 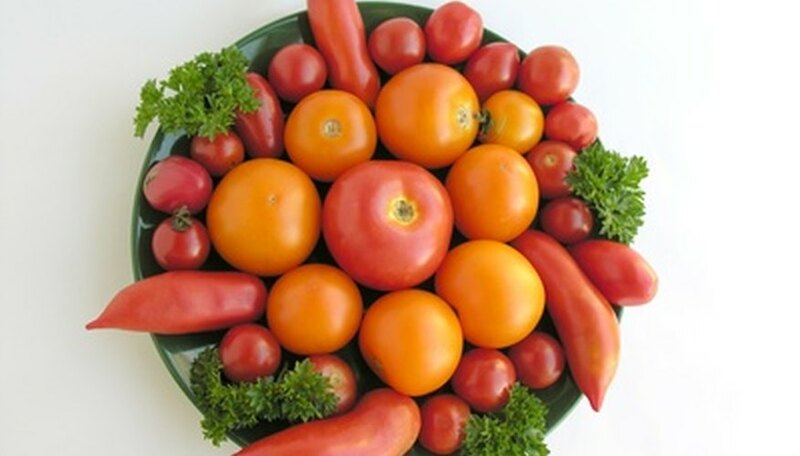 Patio tomatoes are a heavy producer with round, red fruits that are about 2 inches in diameter. These plants are disease resistant, and the fruits mature in abut 70 days. Tiny Tim is a dwarf tomato plant that grows to about 18 inches tall. Perfect for growing in containers, Tiny Tim is a sweet tomato plant that produces bright cherry tomatoes that are about 3/4 inch. Tiny Tim matures in about 45 days. Mountain Spring tomatoes are crack resistant, which makes them well-suited to indoor growing. Grow lights can be harsh on newly producing tomatoes, so a crack-resistant variety is recommended. Mountain Spring tomatoes grow to about 8 to 10 ounces each and mature in approximately 72 days. Celebrity tomatoes have been praised for their disease resistance and their ability to produce even under harsh conditions. Celebrity produces consistently dense, round, red fruits that are between 8 and 12 ounces. This plant produces mature fruit in approximately 70 days.